Albrecht Dürer painted many self-portraits during his lifetime. The most famous and popular one was his third, painted in 1500 A.D. Though he would paint others and include himself in many of his works in various ways, his third self-portrait remains his most memorable one. An oil painting done on wood, this portrait is done in frontal perspective, showing the artist in a view from head to waist. Dürer shows himself as a somber man with shoulder length curly brown hair, light eyes, and a beard and mustache. He is wearing a rich sienna brown coat with a slashed upper sleeve and fur collar. His right hand is curled gracefully in front of him. Early portraits were usually portrayed in a sentimental, religious setting and stylized poses. As more secular portraits emerged in the Renaissance, artists still clung to stylized poses and carefully pretty interpretations of their subjects. 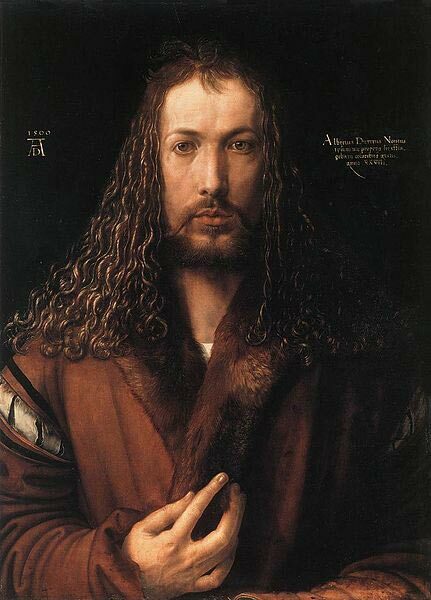 Dürer abandoned the conventional scenery, typical 3/4 pose and carefully manicured subject to present himself as a compelling, realistic subject with slightly messy hair and intense expression. In the religious iconography of the period and preceding eras, usually only Christ was shown in a frontal perspective. Other saints and people appeared in profile or perhaps 3/4 view. Dürer’s choice to use a Christ like pose, complete with hand in front, was bold for its time and has led to much speculation on the artist’s meaning behind the work. The painting belonged to the city council of Nuremberg, and was on continuous display there until 1805, when it was sold to Bavaria. It is now in an art museum in Munich. A copy remains on display in the city hall in Nuremberg.